Some of our Cherry comes from fruit trees that need to be cut due to aging; others are wild, harvested as salvage or windfall. The life span of Cherry is about 70 to 80 years and the trees will rot from the inside, so harvesting at the right time is a good thing. Interestingly, one Wild Cherry tree we harvested was a remarkable 38" in diameter; usually Wild Cherry is around 12" to 14" in diameter when mature. 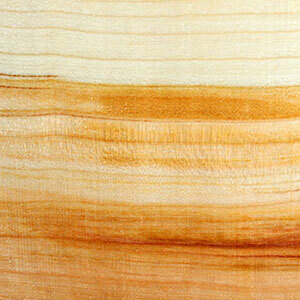 Cherry is a woodworkers' favorite. We quarter-saw some to bring out its light curl and/or dark wavy streaks, but sometimes it is flat-sawn to get the richest figure that reveals the growth pattern. Our stock varies in color from a pinkish to rich red to reddish-brown to dark reddish-brown; it darkens with age and exposure to light. It generally has a fine grain, moderate density, silky texture; it is pliable and turns well, and it is easy to sand so it polishes to a smooth, satin luster. The best thing about cherry wood, in addition to its warm reddish color, is that it is easy to work by hand or by machine. Our fine-furniture customers appreciate Cherry for its steam-bending qualities and its durability as Cherry heartwood is resistant to decay. It takes almost any finish. Cherry is popular with our woodturning customers. It is used for projects as diverse as cabinetry, pipe-making, boat interiors, pianos, or violin bows. Did you know that Cherry belongs to the rose family? Pen Blanks: Approx.7/8"x7/8"x5-1/4" Dozen Pen Blanks. HALF PRICE SALE Was $24, now only $12.